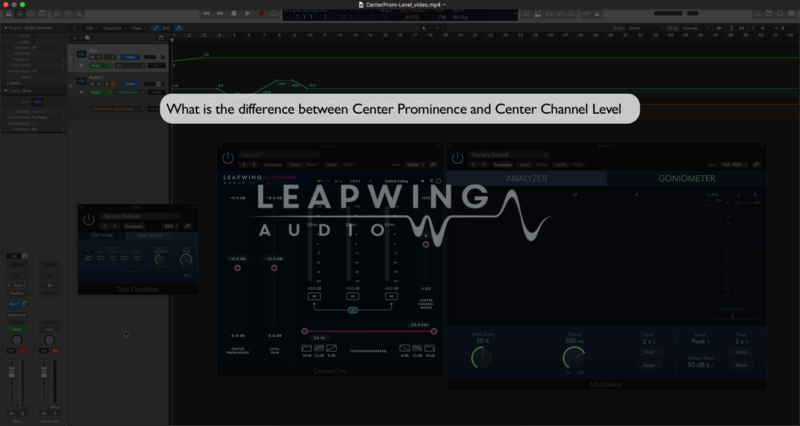 A question we often receive about CenterOne: how is Center Channel Level any different from Center Prominence. Even though both parameters seem similar, they are part of 2 fundamentally different algorithms. So what’s the difference between both? It’s the influence on the PANORAMA! Let’s take a step back and have a look at the UI of CenterOne. On the left, you see Center Prominence, which effectively alters the panning law in a stereo signal, making it possible to change the level of the phantom center. Center Channel Level, on the right, is one of 3 faders to control the output levels of the LCR Extraction algorithm. The stereo output of CenterOne is a downmix of these 3 extracted LCR channels, and the faders allow you to control the individual channel levels. Visualize a stereo mix with 5 panned sources: 100% to the left an acoustic guitar, at 50% to the left a violin, in the center a lead vocal, at 50% to the right a cello, and all the way to the right a piano. If you lower Center Channel Level by 6dB, the vocal level will drop and both instruments at 50% to each side (violin and cello) will move a bit to the side. It will sound like a panning change to those instruments because the LCR balance changes. If you use Center Prominence instead, the panned position of all these sources will remain the same and only their levels will change. So when would you want to use one over the other? You can look at Center Prominence as a gentle solution, and Center Channel Level as a surgical tool. For example, if you would work with a symphony orchestra recording and the balance of the decca tree feels a bit off; there is not enough energy coming from the phantom center. In this case, Center Prominence is a wonderful tool to bring up the phantom center slightly without affecting any positions of instruments in the ensemble. 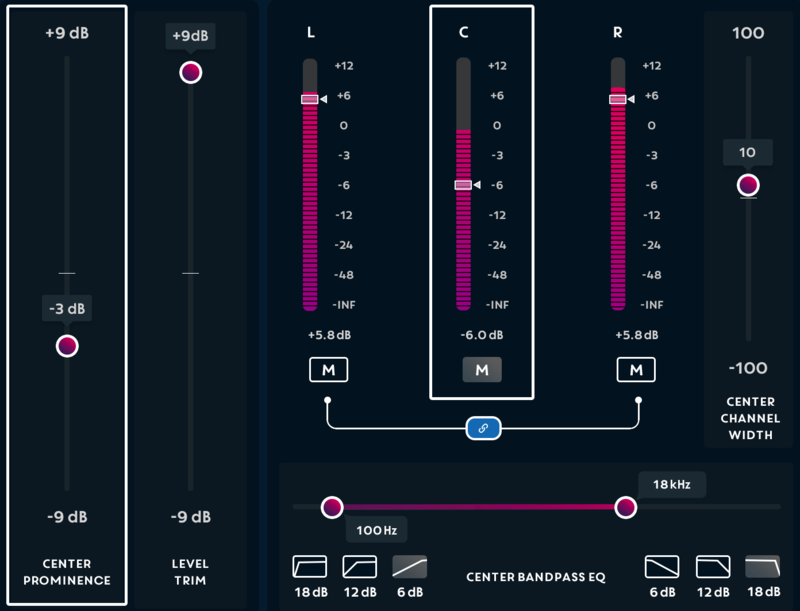 In a different case, if you receive a mix and the vocal is clearly too soft or too loud, but all the other instruments around it are levelled correctly, you can use Center Channel Level to solve this. This example also inspired us to add the new Center Channel Width parameter in CenterOne v2, to allow more control over a particular center signal. If you need to adjust only a narrow center panned source, you can lower Center Channel Width. In case you want to include a bit more of the signals around the center, increase Center Channel Width. Another advantage of the LCR approach is that you can also adjust Left and Right levels individually. In a lot of cases you will notice that it’s the combination of both that works really well. Now, let’s evaluate this parameter behaviour with a sine wave as test signal. The video below shows a simple setup in Logic Pro X. A sine wave is generated on a mono track, and routed to a stereo track that holds CenterOne and a goniometer. The sine wave gets panned to the left, which can be monitored in the goniometer; the signal moves to the left. Keep an eye on this position, because it tells you where the sine wave is in the panorama. When Center Prominence starts to move up and down, you won’t see any change of direction in the goniometer, only the level goes up and down. Next, when Center Channel Level goes up and down – for the same range of +9dB to -9dB, by the way – you will see that the signal starts to turn. The panorama gets affected. The test signal moves to the left side when center level goes down, and to the center when center level goes up. You might ask, why didn’t you guys come up with a single algorithm that does both; splitting stereo into LCR channels ánd maintaining the panorama when levels change? Well, this is where we hit a limitation of signal processing. It is not possible to split into 3 channels, re-level those, and downmix them again into stereo without changing the panorama. Just as it is not possible to split a stereo stream into 3 channels by changing the stereo panning law. That is why we included 2 algorithms in CenterOne: to give you all the options and the ability to combine them!